i don’t know what it is about sunday, the morning after a night of hosting a dinner party, going to a bar to celebrate a birthday, or loosing track of how much wine is flowing while watching SNL, but we often have this fried rice on sundays in our house. i mean, sunday mornings can be, harsh, ahem, and this is definitely comfort food. it’s also so easy to cook that i can fathom making it on slow mornings too. it used to be that we got to enjoy this treat when we were lucky enough to have some day or two-old rice in the fridge, nice and dry and perfect for frying. now i actually plan for it, making extra rice on friday or saturday in anticipation of sunday fried rice. 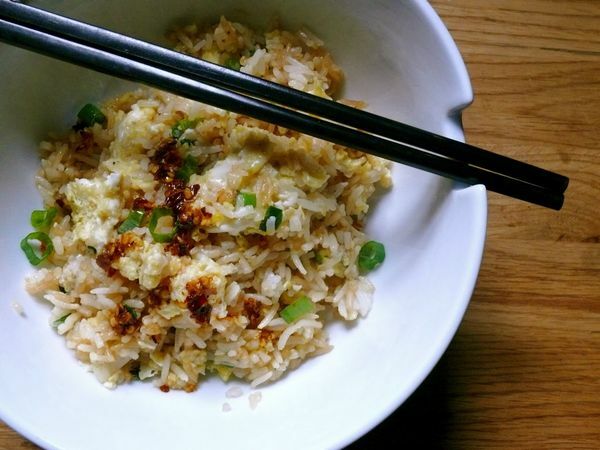 i’ve shared pictures of fried rice on the blog before, almost in passing. 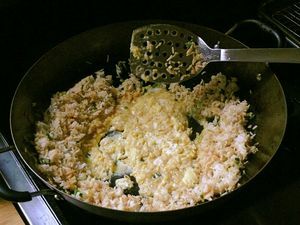 it seemed too simple to really write a recipe for, but then it occurred to me that if you actually haven’t made it before, or made it successfully, you might not be enjoying fried rice every week like me. which won’t do. so i’m sharing my recipe and my 4 easy tips to ensuring fried rice success. as mentioned above, day-old rice works best, but in a pinch, you can use same-day rice that has been cooled, spread out of a plate and refrigerated for a few hours to dry out. i find that cold things fry best, so leave your rice (new or old) in the fridge until you’re ready to make your rice. my mom taught me that heating a pan properly, then adding oil and letting it get hot, then adding whatever it is that you’re pan-frying helps to prevent sticking. does everyone know this? this and frying cold rice really helps to prevent sticking, it’s true. use tamari. fried rice isn’t about dark soy sauce-stained grains, or overwhelming saltiness. tamari adds flavour and a subtle colour. if you don’t have tamari, use the best soy sauce you have–you only need 1 tablespoon of it for this recipe. oh and lastly, don’t be bound to the scallions, for instance, in this recipe. my friend mel told me how to make her garlic-only fried rice and sometimes that’s all i want to eat. if you don’t like sesame oil, you can omit it. my sunday fried rice is not complete without a drizzle of seriously spicy chili oil (surprise! ), but of course, that’s completely optional for you. still, i encourage you to try it topped with some…my mouth is watering just thinking about it, and i’ve already eaten a fiery bowl of it that way today. In a small bowl, whisk eggs, water, sesame oil, 1/4 tsp salt and pepper together. Set aside. Heat a wok or a large, high-sided skillet over medium-high heat. Add oil and swirl to coat the bottom and sides of wok. Add scallions and stir-fry for 30 seconds. Break up rice and add to wok with a pinch of salt, and stir-fry for about 3-4 minutes, pushing rice into the surfaces of the wok then mixing it up quickly and repeating to fry each grain. 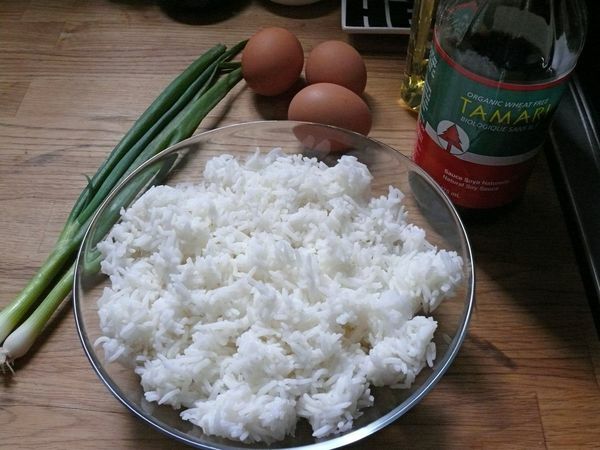 When the rice is fried, add the tamari and mix quickly to coat the rice evenly. Reduce heat to low and push the rice to the high-sides of the wok, creating a nest with a hotspot in the middle. If using a pan, do the same and make sure the hotspot is large and positioned directly over the heat source. Pour the egg mixture into the middle and stir only the egg mixture, scraping the bottom of the pan to avoid sticking. Then let the eggs cook, stirring only occasionally, for about 3 minutes. The eggs should scramble with the stirring, but set up too. When the eggs are cooked and cohesive but still soft, break the egg up into large pieces and toss well with the rice. Remove from heat and serve with chili oil if desired. Thanks for the tips! I love fried rice but haven’t managed to make a successful batch yet. Try using fish sauce instead of soy or tamari for a Thai fried rice twist. oooh. i dont use fish sauce anymore because im vegetarian but that sounds delicious!